Apple has blocked it from going on sale in Australia, and Samsung postponed the launch event, but we did some probing and were lucky enough to get our hands on the hotly-anticipated Galaxy Tab 10.1 Android tablet before its official release in Australia. So, what's all the fuss about? From the moment you pick up the Galaxy Tab 10.1, it's clear that this is a very different beast from the wealth of Android tablets already on the market. It shares a similar screen size (10.1in) and many of the same specifications as its competitors, but the build quality and design of the Galaxy Tab 10.1 is simply superb — something we can't say about most of its competitors. 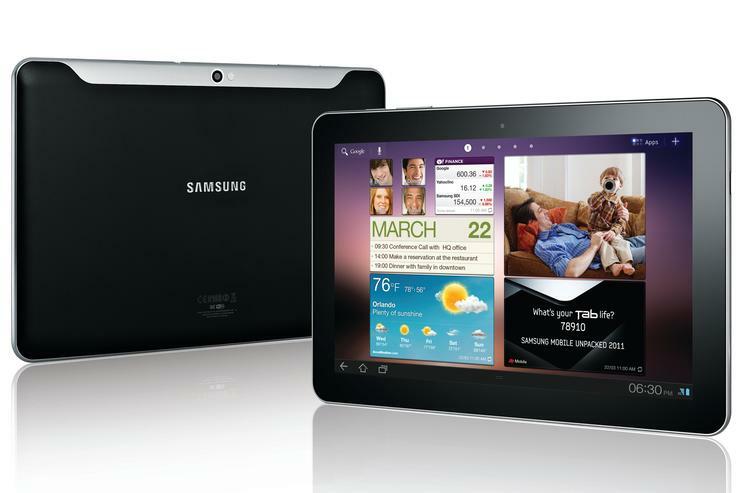 The Galaxy Tab 10.1 immediately stands out amongst the pack for all the right reasons. First of all, at just 8.6 millimetres thick, the Galaxy Tab 10.1 is thin enough to be described by Samsung as "the world's thinnest mobile tablet". Yes, that's ever so slightly thinner than the 8.8mm thick iPad 2. Although that doesn't seem like a deal breaker if you're comparing it directly to the iPad 2, the Galaxy Tab 10.1's weight of just 565g is a big deal. This makes it easy to hold in one hand, and very comfortable to use for long periods. In fact, the thin and light design makes the Galaxy Tab 10.1 look much smaller than it really is — it does not look or feel like a 10.1in tablet. The Samsung Galaxy Tab 10.1 Android tablet is constructed largely from plastic, but still manages to feel extremely well built. The materials used are of a high quality, right from the glossy black bezel surrounding the display, to the soft feeling, rubber-style plastic that adorns the rear, and the stylish, curved edges. The finish on the rear may not look as flashy as the glossy front of the tablet, but the soft feel makes the Galaxy Tab 10.1 easier to grip, particularly if you're holding it with one hand. The Samsung Galaxy Tab 10.1's svelte frame definitely made it tough for Samsung to include extra ports, but the tablet covers most of the basics. On the top edge of the Galaxy Tab 10.1 you'll find a headphone jack, volume buttons and a power/screen lock key. On the 3G model, you'll also find a SIM card slot that's covered by a relatively sturdy plastic flap. The buttons fit in well with the rest of the tablet's excellent design: they feel sturdy, are well placed and provide good tactility. On the left and right side of the Galaxy Tab 10.1 you'll find dual-speakers, covered by glossy silver mesh, while the bottom of the device houses Samsung's proprietary dock connection. This connector looks remarkably similar to Apple's 30-pin connector port used on the iPhone and iPad. The Galaxy Tab 10.1 doesn't have a full sized USB port, or even a micro-USB port: both charging and connecting the unit to a computer via USB is achieved through the included, proprietary cable, much the same as an iPad. The main disadvantage is that you'll need this included Samsung USB cable to charge and synchronise the tablet and can't use any old micro-USB cable. However, on the plus side, the proprietary connector charges the Galaxy Tab 10.1 much faster than a standard micro-USB port could. Sadly, the Galaxy Tab 10.1 does not have a HDMI-out connection, so it can't be connected to a high definition television or projector. Under the hood, the Samsung Galaxy Tab 10.1 is powered by a 1GHz dual-core processor, has a capacitive, 10.1in, TFT display with a 1280x800 resolution and features Bluetooth, Wi-Fi and GPS connectivity, with 3G models also an option. The Galaxy Tab 10.1 has a 3 megapixel rear camera and a 2 megapixel front camera, and is capable of playing back 1080p HD video, but it does not have a microSD card slot for extra memory. 16GB and 32GB models are likely to be sold in Australia, but it is not yet known if Samsung will sell a 64GB variant of the tablet.